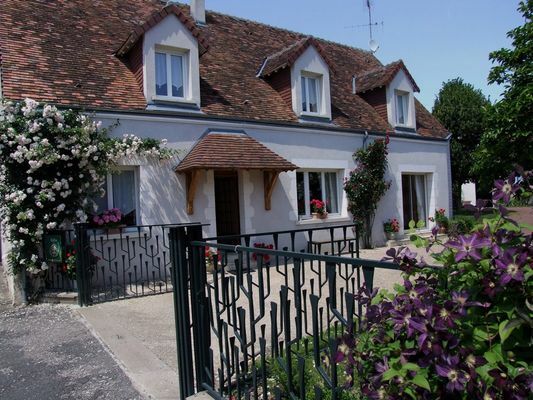 Detached house, fenced courtyard and grounds (800 m² of lawn), close to the Loire châteaux, the Vendôme area and the gentle charm of the villages of the Cisse Valley. Aerodrome 8 km. Table tennis, badminton and climbing frame on site. Grnd flr: fitted kitchen, living room, shower rm, WC, 1 bedrm (1 large double bed), 1 bedroom (1 double bed). 1st floor : mezzanine (living room, bookcases), bathroom, WC, 1 bedroom (1 double bed + 1 cot), 1 bedrm (3 single beds). Central heating incl. Laundry room. Hi-Fi. Access to free public tennis courts. Fishing in public lake. There is no review about La Forge De Champigny, be the first to leave one !